Questions running through your mind on a camp tour: How old is this counselor? How safe is that archery range? Is my shy kid going to have a hard time fitting in? Should we sign up for one week or two? Running through your child’s head: So that’s what a ropes course is! Whoa. While you’re trying to figure out what makes one camp stand out from the rest, your child may still be wondering what summer camp even is. The best way to satisfy your curiosity and your child’s is by visiting a camp and experiencing its magic firsthand. Beyond the answers you can find in your research or even over the phone, you’ll be able to talk to camp staff directly and get a sense of the people who will be responsible for both your child’s safety and for setting an example during a time of major exploration and growth. Kids will be able to connect with the place and the people experientially, too, and to conceptualize things that may be brand new. Your child’s questions may be hard to predict or define, but let’s look at some of the questions that can help you get a confident sense of a camp’s true quality and values. We’ll even look at ways to read between the lines of the answers, so you can gain real clarity around whether a camp is a good fit for your family. Is this camp accredited by the American Camp Association (ACA)? The ACA developed the only professional standard of evaluation for camps. Camps with accreditation must comply with a comprehensive list of health, safety, management, and program quality standards. If a camp is not accredited, you can come up with a longer list of questions to answer the unknowns, but if a camp is accredited, you know that a lot of your potential questions and concerns are already cleared. What is the camp director’s level of experience? So much of how the camp is run comes down to the director’s decisions—not to mention the fact that they’ll be the one in charge in cases of emergency. The ACA requires that a camp director be 25 years old, have a bachelor’s degree, and two or more seasons of experience in camp supervision, plus five hours every year of dedicated professional development. Beyond their professional experience, their character and values will definitely play a role in shaping the camp’s culture, so if you have the chance to meet the director, take it. It’s also likely that the director is the one making the final hiring decisions. In the world of summer camp, it’s often true that the more experience someone has, the higher their personal standards are for their camp, their counselors, and other staff. How is your staff recruited, and what kind of training do they receive? Campers spend more time with their counselors than with any other staff at camp. Counselors are a lot more than just supervisors; they are role models for your kids. At Kennolyn, we hire truly exceptional people from around the world because we recognize how much our camp’s value hinges on those leaders. Our counselors receive training not only in the specialty area they’ll be leading, but also in child development for all ages, group leadership, safety, and even how to keep camp traditions alive. What is your ratio of campers to staff members? The more counselors there are for a group of campers, the more individual attention and mentorship kids will receive. Imagine the difference between a group of twenty kids following a single counselor around, and the same group with four counselors trained to work together to create a safer, more interactive program. With more hands on deck, campers will be safer and have more opportunities to connect with their counselors. The ACA recommends a 1:5 ratio for campers aged 5 or younger, 1:6 for campers of 6–8 years, 1:8 for campers 9–14, and 1:10 for campers 15–18. What is the camp’s level of health supervision? California state regulations require that camps have a health supervisor who is either a doctor, RN, or LVN or someone with combined training in CPR, preventative health practices, and pediatric first aid. You want to make sure this level of supervision is covered for obvious reasons, but consider, too, that the more robust a camp’s health center is, the smoother the camp experience will be overall. Bumps and bruises will happen—to your kid or another—as will some more serious issues, but if there is a contained system in place for thorough, compassionate care, camp activities can continue without a hitch, and the camper-patients can return to the fun without much interruption. What kind of kid is most likely to have a good experience at camp? I think it’s always good to ask a couple of open-ended questions that reach for more personal answers. This question is subjective, but it might give you a better sense of the camp’s culture and how they perceive kids’ needs and strengths. 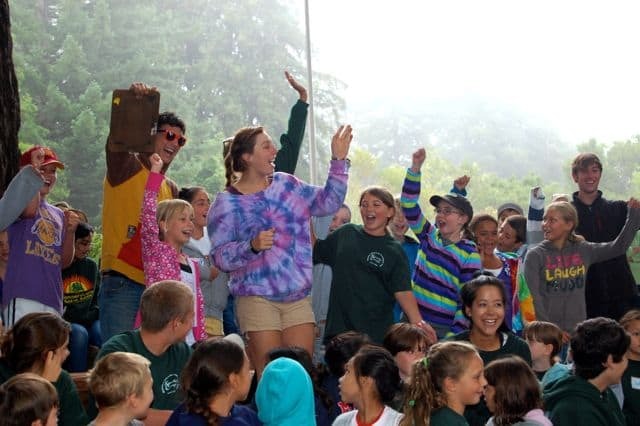 Ideally, the answer reveals more than just one kind of kid because the camp itself helps campers to feel a sense of belonging among a diverse community. What makes your camp different? This question might catch your listener off guard, and that’s a good thing because you want to give them a chance to speak from a genuine place, not just from the realm of facts. Ideally, they love their camp so much that their face lights up, and they tell you about their personal experience of why this camp is so great—perhaps the camp’s traditions that help to bring kids back year after year. In fact, it would be good to ask this question of as many people as you can during your visit in order to take your perspective to a deeper, more personal level. The most important question you can ask is, “How does my child feel about this place?” Obviously, all of the other considerations are significant, but none of the ideal answers even matter if your child doesn’t connect with the camp. Kids are incredibly curious, but they may not know how to convert that curiosity into questions. It may not even occur to them that they need to ask questions, and that’s okay! Being on site at camps brings their curiosity down to the ground as they see what a “cabin” really is, how far away the bathrooms really are across the path, and what the famous ropes course looks like in real life. Your kids may not have a list of questions in hand, as you do, but they have even more of a need to see and touch and believe in the special experience that is summer camp. You can contact us at any time of the year to schedule a visit, or call us up just to chat and get to know our programs better. Kennolyn’s magical setting is hard to describe, located on 300 vibrant acres in the Santa Cruz Mountains. Come see for yourself!